In Bernburg (near Magdeburg) a mental home with a capacity of 132 beds was founded in 1875. During late summer of 1940 a section of the complex was leased to the Gemeinnützige Stiftung für Anstaltspflege (Public Welfare Foundation for Mental Nursinghomes), better known as Aktion T4. 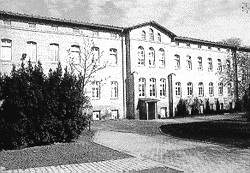 From then onwards Bernburg mental home was divided into a regular institute and an euthanasia killing site. During the Sonderbehandlung 14f13 (Special Treatment / in Bernburg from 1941 until April 1943) about 5,000 persons were killed in Bernburg, mainly Jews from the concentration camps Buchenwald, Flossenbürg, Groß-Rosen, Neuengamme, Ravensbrück andSachsenhausen. The buildings, not leased to T4, continued to operate as regular mental institution during the whole period! 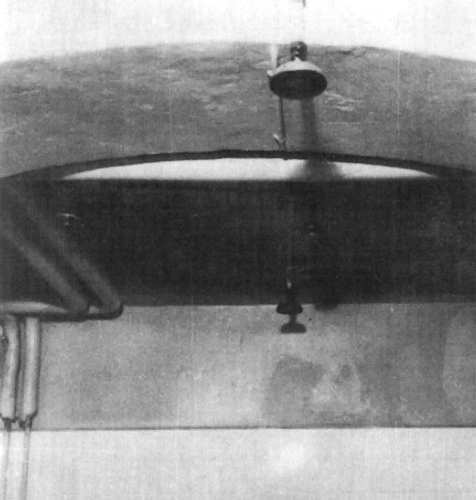 Sprinkler in 1945 Because of an order from the WVHA from 27 April 1943 at least the cremation ovens were dismantled, the T4 personnel transferred to Poland (see Aktion Reinhard). 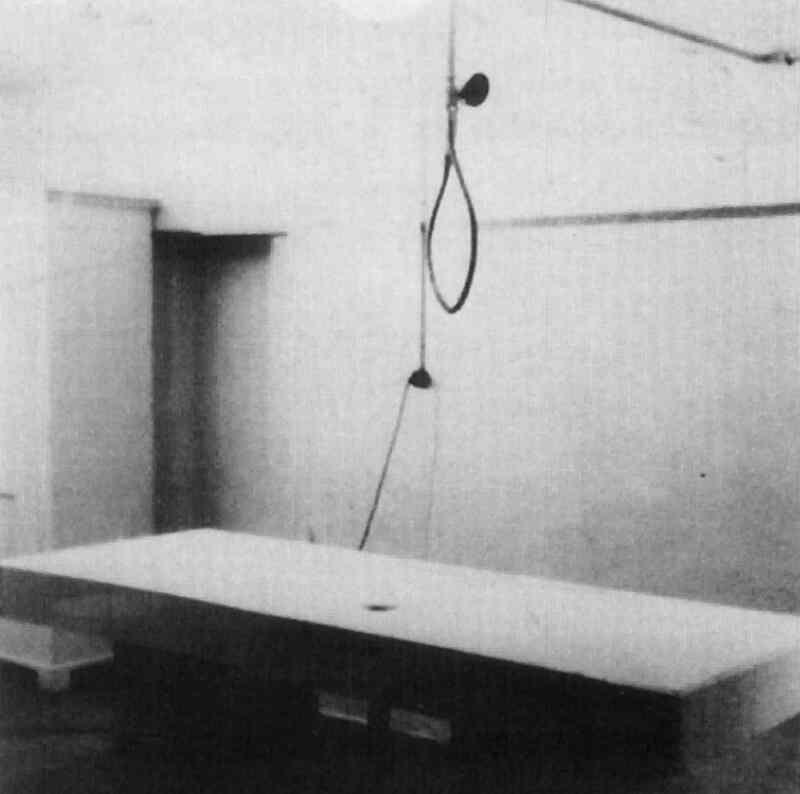 In 1949 the nurse Anna Maria L. (Ludwigsburg archive files La - Le) still saw in the cellar some benches on which the victims waited for "having a shower", the sprinklers in the gas chamber and the dissecting table. 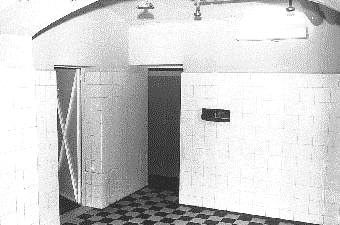 In course of the construction works for the memorial (1988/89) the peephole in the gas chamber wall and the gas chamber door came to light. In January 1948 the former director Dr Irmfried Eberl was arrested. He evaded trial by committing suicide in February 1948. 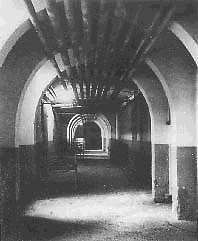 Some other persons of the Bernburg staff were sentenced after 1948, but most of them have never been brought to justice. A number of Aktion Reinhard personnel served at Bernburg, these include Rudolf Bär, Johannes Bauch, Max Biala, Helmut Bootz, Werner Borowski, Werner Dubois, Kurt D., Irmfried Eberl, Erwin Fichtner, Herbert Floss, Karl Frenzel, Erich Fuchs, Albert G., Siegfried Graetschus, August Hengst, Gottlieb Hering, Fritz Hirche, Erwin Lambert, Willy Mätzig, Johann Niemann, Josef Oberhauser, Karl Pötzinger, Wenzel Rehwald, Gottfried Schwarz, Fritz Schmidt, Otto Stadie, Franz Stangl and Christian Wirth.